Rex and his friends go camping a number of time each year so he is always looking for a Camping Lantern #thebrightoutdoors. I found Bright Outdoors Solar Lantern / Flashlight with Emergency Powerbank – LED, USB Rechargeable and Collapsible. Versatile Camping, Safety, Patio or Travel Lamp. Portable, Innovative Sun-Powered Light. There are a lot nice features of this lantern. First it folds to a compact 2 inches high and fits perfect in a backpack for hiking. It is charged by the sun and can be used as an emergency charger for you phone! It can hang so the boys can use it in the tent. It gives you about 10 hours of torch light. We used it the other night when the transformer near our house blow up. We used it to find a few candles and other lights. It was very bright. The Bright Outdoors Solar Lantern has a low and a high light mode along with a flashing one for an SOS if you are in trouble and need help. 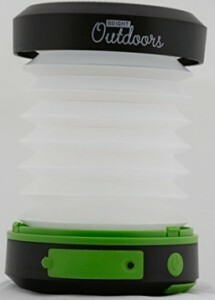 The Bright Outdoors Solar Lantern seems very durable and will get a lot of use by Rex. It is a great lantern and you can purchase your own on the link below from Amazon.com.